A teenage girl learning to drive with her mother accidentally struck and killed two men in a Philadelphia parking lot on Monday night, 6/4. 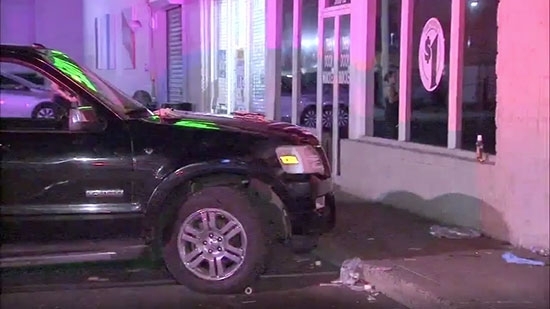 It happened around 8:45 p.m. outside the Dollar Tree store on the 3600 block of Aramingo Avenue in Port Richmond. The 15-year-old driver was at the wheel of an SUV and was pulling straight ahead into a parking spot. Two homeless men in their 50s were guiding her into the spot when something happened and the vehicle lurched forward striking the men. The girl's mother and two other people were in the car at the time. No charges have been filed but the investigation is on going. A driver needs to be 16-years-old to obtain a learner's permit in Pennsylvania. The identities of the victims have not been released. June 5th Memorial Park was unveiled today on the 5th anniversary of the tragic Center City building collapse that took six lives and injured 13 more. The memorial is located at 22nd between Market and Ludlow Streets in Philadelphia. On June 5th, 2013, part of a building being demolished collapsed and fell onto the Salvation Army thrift store next door. The memorial has 6 windows, one for each person killed, and a 7th window for us to remember our loved ones who have past. The memorial also hopes to remind us to learn from our mistakes, to never forget the tragic results of carelessness and greed. Those responsible for the accident have been taken to civil and criminal court. Upper Darby Police Superintendent Michael Chitwood is disputing a statement made by Upper Darby School District Superintendent Dan Nerelli about a stabbing incident at the high school on Monday, 6/4. Nerelli sent this message to parents, "Yesterday, two freshman students engaged in an altercation in a stairwell just prior to dismissal. During the altercation, one student used a pencil to puncture the arm and back of the other student. The injured student was evaluated at the hospital and has since been released. He is expected to recover fully." Chitwood says that after talking with the medics and physician at Lankenau Hospital, the wounds received by the victim were consistent with that of a knife. Superintendent Dan Nerelli responded saying his statement was based on information they were provided. Upper Darby police do have a 14-year-old suspect in custody. New Jersey democrats selected incumbent U.S. Sen. Bob Menendez in the wake of a federal corruption case that was dropped last year. He beat challenger Lisa McCormick in the primary. Republicans selected former Celgene Corp. CEO Bob Hugin to represent the GOP this fall against Menendez. Brian Goldberg lost out this primary.